Presenters can now use their USB connected PC Microphone to present live using the new “Present Using PC Microphone” webcast type. This enables presenters to connect directly to the webcast over the Internet rather than dialing out using a separate phone. 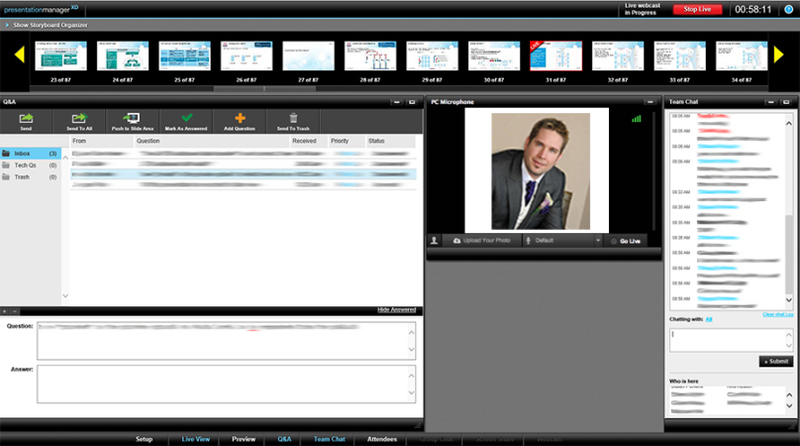 Up to 10 presenters can connect to the presentation manager tool during the live webcast and switch between themselves using the built-in application. The PC Microphone interface in the presentation manager also allows each presenter to upload a photo which will be displayed to the webcast viewers when that presenter is live. Other users in the presentation manager also see the presenter’s photo displayed during the webcast.